On June 17, Marty Perlmutter, of Miami, began an ambitious 1,400 mile bike journey that will take him through 15 states up the eastern seaboard. On Friday, June 29, Perlmutter finished his 13th day of cycling escorted from Manhattan to Connecticut with Darien's Tom Holland, a fitness expert, media figure and the coach of the Multiple Myeloma Research Foundation's Endurance Events Program. Their ride on Friday ended at Norwalk's Calf Pasture Beach with a large and colorful welcome by a "cheer zone" made up of MMRF employees and local supporters. 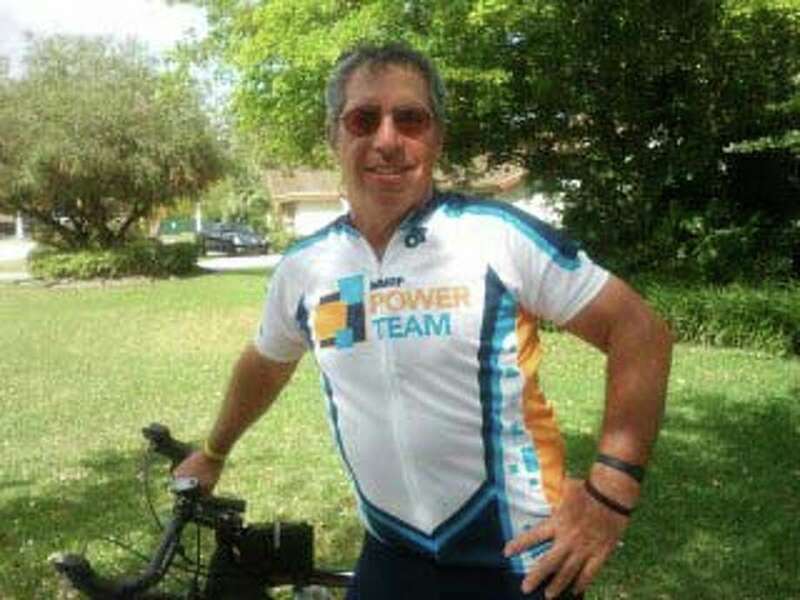 Perlmutter is riding to honor his best friend Roy Gross, who lost his battle with multiple myeloma this year. While calling Gross every day while he was in the hospital, Perlmutter knew he wanted to do something big to make a difference in the lives of myeloma patients. He decided to plan an epic cycling trip from Jacksonville, Fla., to Kittery, Maine. When Roy Gross died on March 9, leaving instructions for friends and family to donate to Perlmutter's ride for the MMRF in lieu of flowers, he was more committed than ever to carry through with his plans. Perlmutter, owner of LeaderBoard, a Miami/Ft. Lauderdale-based company that helps nonprofit organizations and corporations host more successful fundraising events, is now putting is efforts into his own fundraising campaign, with a goal of raising $20,000 through the ride. Ninety percent of the funds raised for the MMRF are budgeted for myeloma research and related programming. The MMRF is the world's largest private funder of myeloma research. Perlmutter has been an avid biker and charity rider since 2008 but hadn't heard of multiple myeloma or the MMRF until Gross's diagnosis in 2011. He was then drawn to the MMRF for its highly regarded work to find a cure and discovered the Run/Bike/Tri Your Own Race Program which supports athletes with any race in any place through the MMRF PowerTeam. "This past summer, when Roy was so sick, I told him I was going to ride my bicycle from Jacksonville to Kittery to raise money for the Multiple Myeloma Research Foundation," Perlmutter said. "I told Roy, I can't cure you but I can sure do something to help and if my efforts are able to make a difference in someone's life in the future, I will know my ride wasn't for naught." The death of his friend has only strengthened Perlmutter's resolve to make the 1400 mile effort a success. Perlmutter rides as part of the MMRF PowerTeam, a group of endurance athletes who tap into their power to make the difference in the lives of myeloma patients by reaching out to their friends, coworkers and family members to raise funds for the MMRF's urgent work. The MMRF has facilitated unprecedented accomplishments including helping to bring four new drugs to market that are now standard therapies for patients with multiple myeloma and being used or explored as treatments for more than 30 other cancers. "The success of the MMRF Endurance Events Program lies in the passion of each person who commits to not only take on the challenge of a these strenuous events, but to make a difference in the lives of patients with multiple myeloma," Alicia O'Neill, who heads up the MMRF Endurance Events Program, said. "Marty's devotion to his friend and his determination to raise funds to honor him and help find a cure for multiple myeloma are so inspiring and helpful to patients who will benefit from the research funds raised." Since its inception in 2008, the MMRF Endurance Events Program has raised more than $6 million for research. In 2012, the program will recruit more than 700 PowerTeam members to participate in marathons, triathlons, cycling event and other races across the country. The Multiple Myeloma Research Foundation was established in 1998 as a nonprofit organization by twin sisters Karen Andrews and Kathy Giusti soon after Giusti's diagnosis with multiple myeloma. The mission of the MMRF is to relentlessly pursue innovative means that accelerate the development of next-generation multiple myeloma treatments to extend the lives of patients and lead to a cure. As the world's No. 1 private funder of multiple myeloma research, the MMRF has raised more than $190 million since its inception and directs 90 percent of total budget to research and related programming. As a result, the MMRF has been awarded Charity Navigator's four star rating for nine consecutive years, the highest designation for outstanding fiscal responsibility and exceptional efficiency. For more information about the MMRF, visit www.themmrf.org. In 2008, the MMRF started a marathon program that has since grown to include select short distance road races, half marathons, triathlons, cycling events and the option for athletes to participate in any event, in any location, at any time, to benefit the MMRF. In 2012, the MMRF hopes to recruit more than 700 PowerTeam members and raise $2.2 million through its Endurance Events program. Since its inception, the MMRF Endurance Events Program has raised more than $6 million for research.